When I woke up on 6th June 1944 it didn’t seem like a special day. There was no radio in those days with a continuous stream of unfolding news and you couldn’t see the sky from our kitchen window. Switching the radio on was a special event. It was normally rationed for important events like the 9 o’clock news and ITMA. But then everything was rationed, even listening to the radio, in case the Eveready All Dry Battery No 3 wore out. At 14/9 (73p) they didn’t exactly come cheap when they cost half a working man’s wages for a week. To make the battery last longer we would pop it into the kitchen range oven to warm it up. It was when I stepped out of the front door of our shop into the Market Place, East Finchley in north London to go to school that morning, that I realised everything was different. People were just standing, not moving. They were staring up into the sky at the hundreds of planes over London. Each one had three white stripes round the wings and the fuselage. I’d never seen that before. It would become yet another thing to put in my drawings. At school, our teacher said, “Remember today, children. It is the most important day in all our lives. Today is D-Day. The allies have landed in Normandy”. A few days later, she pinned a map of Europe on the wall with two lines of pins. A blue line in the west and a red line in the east. Every Friday afternoon, a chosen girl and boy from the class would move the lines of pins closer. One day, nearly a year later, they met at a shattered bridge across the Elbe. Each line represented the Allies to the west, and the Russians to the east. As the pins moved closer we learned the name of yet another European capital city. Then we saw grainy newsreels at the cinema of smiling Russians dancing with GIs. Some of the grinning Russian soldiers were women, and they had Tommy guns. We little boys were impressed with that. A week after D-Day came the first V1, known as the Doodlebug. They sounded like a badly tuned, backfiring motorbike. Carrying a ton of explosive, the damage the V1 caused was enormous. Up to D-Day, a total of 126,00 houses had been completely destroyed by bombing. There were another million damaged. With a system of patching and basic repairs, and that included the house and shop we lived in, there were still 150,000 still derelict and empty by 1944. If Churchill knew the Nazis had secret weapons, the general public had no idea what was to come. In March 1944 Parliament had a debate on the chronic housing shortage and the need for more houses after the war. Stung by the criticism, Churchill broadcast his answer a week later. He announced a 12-year plan for the building industry when peace came, guarantying full employment. Then he gave the first details of the Ministry of Works scheme for, ‘Emergency Factory Made Houses,’ or EFMs, promising 500,000 immediately after the war. 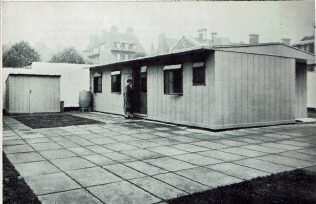 With those statements, Churchill launched the Emergency Factory Made prefab programme. Churchill knew, from first hand experience the dangers posed by not having enough houses when peace came. He’d been a minister in Lloyd George’s government in 1918 at the time of the Homes fit for Heroes Election. He, above all, realised that millions of demobbed servicemen and women would not readily go back to the privations and hardships of the 1930s, but they could be controlled by promises. Even if some politicians knew the promises would not be kept, it would be too late when the returning servicemen found out. But by then, they would have laid down their arms and, hopefully, someone else would be in power. When the war ended, what better solution could be found than to turn over the skilled workers in aircraft factories to producing factory made housing? As the argument went, “If it could be done in the war why couldn’t it be done in peace time?” Also that way, the massive and inevitable unemployment, when service men and women were demobbed, would be avoided. It seemed a win-win situation, but no one had factored in the entrenched attitudes of the British building industry and their allies in the press, like Max Aitkin the first Lord Beaverbrook, owner of the Daily Express, and Harold Harmsworth the first Lord Rothermere and owner of the Daily Mail. This came to a head in 1945 when Churchill lost the election. Then they turned on council housing and prefabs with fury. Costs rose as America asked for its loans to be repaid. Some MPs asked why council tenants should have an indoor bath when they would only keep coal in it. But that was all in the future in 1944. The needs of the war, both financial and physical, had forced on the coalition government the need for centralised planning, backed, where this could be provided by research. It was no longer good enough for governments to make things up as they went along. The stakes were far too high. 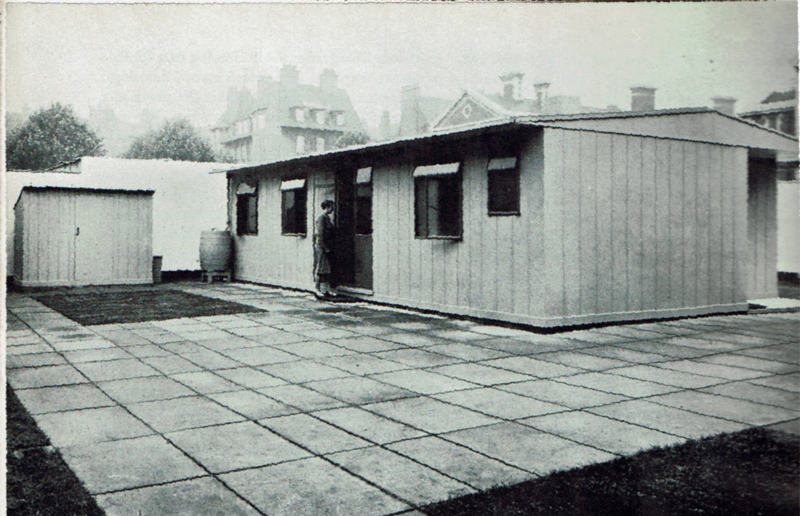 The Burt Committee formed in 1942 reported, in 1943, on pre-war prefabrication of housing. 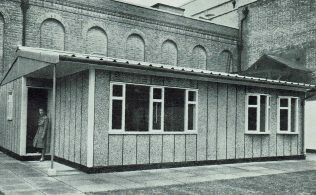 Following this the Ministry of Works and Planning and the Ministry of Aircraft Production, produced the Portal House, named after the Minister of Works, in March 1944, closely followed by the AIROH house. That was made of aluminium alloy, with an aircraft factory producing one every 12 minutes. The Portal House provided the blueprint in terms of cost and size. It had a floor area of 616 square feet (57.25 square metres) and a cost of £600. It was criticised over the amount of steel used in its construction. A young, thirty-year-old architect, working in the office of Donald Gibson, then city architect rebuilding Coventry, wrote to Portal and said he had an idea for a house. Portal wrote back to George Edric Neel, asking if he could do it with less steel. Satisfied with his answers, Portal gave him the go ahead. Together with Raglan Squire and Rodney Thomas, Neel moved to London, opened an office and formed ARCON. 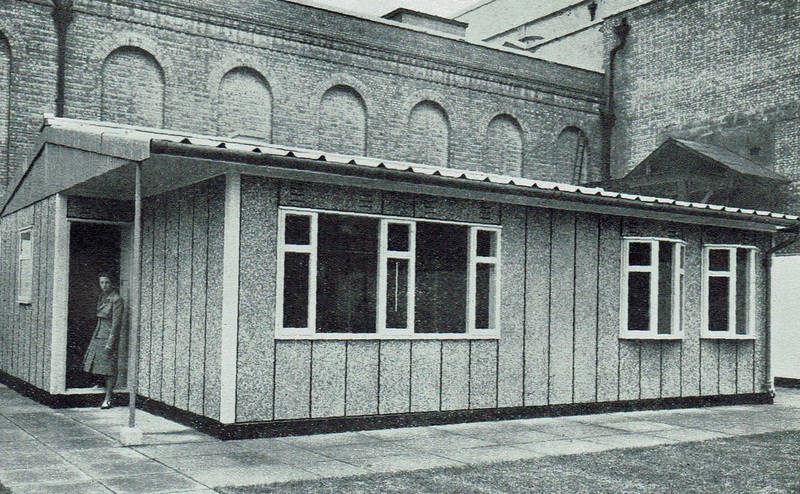 They produced the ARCON Mark V prefab. Ove Arup designed the steel frame. Taylor Woodrow were brought in with their knowledge of construction and the building industry. They were one of the firms fabricating the giant and secret concrete sections of the Mulberry Harbours for D-Day all over the south of England. Our house, part of a general stores and off licence belonging to Courage’s Brewery, was no exception. In November 1940, the night after Goering and Hitler set out to destroy Coventry, a one-ton landmine fell on Chapel Street in the High Road, East Finchley, and laid waste a vast area. All the windows of our house and shop were blown in. Every ceiling was brought down. In the shop itself the damage was spectacular. One of my mother’s brothers, who was in the navy, had fixed square strips of wood in front of shelves full of bottles of beer and jars of sweets, to hold them in place and stop them falling off in a bomb blast. He had not got round to the shelves on the other side of the shop. These had jars of jam and tins of beans. In the pressure wave of the massive explosion these were sucked horizontally across the shop. They smashed into the bottles of beer and jars of sweets on the other side. Our cat was covered in broken glass and jam. My mother just sat down and cried. My dad, who was granted compassionate leave from the Rifle Brigade, stuck little bits of translucent plastic pretend glass in our windows, which we got from the local food office. You couldn’t see through the handful of clear ones, and there were a lot of black pieces that blanked out the light. My mother sent us both back to see the jobsworth who had grudgingly issued them to us, to tell him it was for a food shop. Her will prevailed. At least we had some light through until we got new glass. Our house and shop, which was quite Dickensian behind the picturesque façade, boasted gas lighting, one solitary inside cold tap, a Belfast sink, a gas stove, an outside loo, a pump in the yard just in case the water supply to the tap froze, and a tin bath hanging on a nail on a wall in the yard. We kept chickens in the yard. Each Easter we would buy 24 fluffy day-old chicks at Barnet Fair. We ate those that survived and grew to maturity and stopped laying. During one air raid a piece of shrapnel went through the bottom of the bath. This meant until we moved, just after the Coronation in 1953 into a house and shop in Kingsbury, always having to melt a candle to waterproof the hole to stop the kitchen being flooded. Our new house with its electric lights, power points, a bathroom and an indoor toilet, was an Aladdin ’s Cave of untold luxury. As a six year old schoolboy in 1944, stepping into an ARCON Mark V prefab was like stepping into a future I could only dream of. Here was a house so beautifully designed, it had everything. There was the luxury of a fitted kitchen. Today we take all that for granted. Then you only saw such luxury in Hollywood movies. There was a fridge in the kitchen that made it like Hamleys’ Toyshop. Ice creams were in short supply in the war and my dad said you could keep them in the ice-box. If it could inspire such enthusiasm in a nearly seven year old child, imagine the impact it had on grown ups, especially women like my mother and her sisters. It was all so clean and bright. This house was warm. Ours was so cold that in winter you didn’t want to put your feet down the bottom of the bed unless you had a warmed up brick wrapped in a towel. There were huge queues to enter each house. People just waited patiently in line. The war had trained them for that, queuing for buses, queuing for trains, or coal, or food. We stood in line for everything. One day, after VE Day my Dad took me to see a U Boat which had been towed up the Thames and moored on the South Bank near St Thomas’ Hospital. There was a high wooden fence that I couldn’t see over. The long queue stretched across Westminster Bridge. We went through a wicket gate down a gang plank and up a ladder on the side of the conning tower. The U boat was small, black with white lettering on the conning tower. We climbed up and entered a hatch. Inside it was very small, cramped and smelly, with wiffs of oil, damp and feet. It was like the inside of a Northern Line Tube train, but smaller. Everything was green, lots of pipes and bunks which let down one above the other from each side. These were covered with green leather. We saw lots of bulkheads to shut sections off, engines and torpedo tubes. Then we looked up the periscope. Later walking along Oxford Street with my dad, we saw the end of a very long queue. I was told to stand at the end to keep a place while he went to the front to find out why people were queuing. That’s how it worked in a world full of shortages. He came back smiling. Eventually we reached the front and I found myself in front of Woolworths. Three couples were let in at a time and we filed downstairs where there were huge fridge freezers. A man reached in and gave my dad a newspaper wrapped parcel. He gave it to me on the tube. It was cold and as I sat holding the package I saw people sitting opposite looking at my hands in horror. I looked down and saw there was something red running down between my fingers. I licked it. It tasted nice. We had bought a pack of Libby’s American frozen strawberries, the first I had ever seen. As the war came to an end prefabs, and the ones I saw in north London were mostly ARCON Mark V ones, sprang up on every available spare piece of land. People obviously loved them. They cultivated their gardens and allotments and kept chickens to become almost self-sufficient in food. It was like the “Good Life”, only 30 years before anyone thought of writing a TV series about it. In the 1960s I read “Walden” by Henry Thoreau. Written between 1845-47, it begins, “When I wrote the following pages ……. I lived alone, in the woods, a mile from any neighbour, in a house which I had built myself, on the shore of Walden Pond, in Concord, Massachusetts……” Thoreau’s masterpiece shows how owning one’s own home, and in his case building it, or at least having a secure home, can banish worries, especially those of the landlord’s footstep on the stair as he comes with your eviction notice. Prefabs took that worry away. 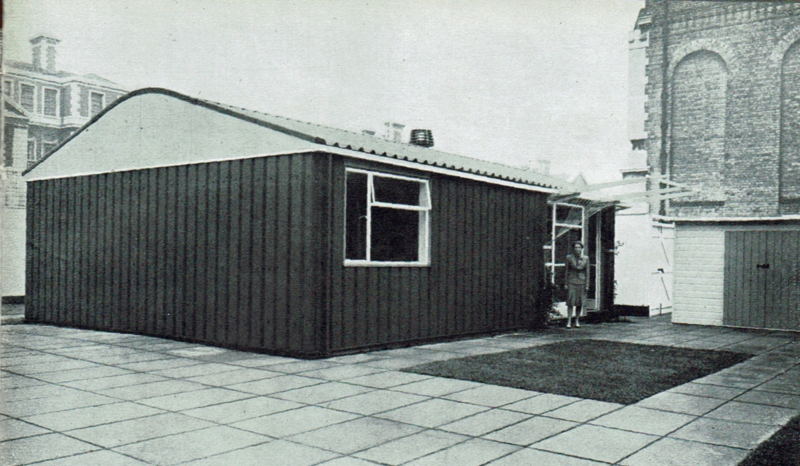 That was the joy ordinary people found in those post war prefabs. They embraced them to live happy lives in comfort after the unemployment and squalor of the 1930s and the horror and terror of the 1940s. The trouble was we thought post 1945 and when I left school nine years later to go off and study architecture, that those times which got better, just like the song said, would never end. But they did in 1979, when everything was put into reverse. We got the neo-cons and “Right to Buy” and now we have Grenfell Tower and the enormous unfolding scandal surrounding it. Why does it take the deaths of so many innocent people, as happened between 1939-45 and now over 70 years later with Grenfell Tower, before politicians change their minds? Photographs from The Rehousing of Britain by John Madge, published 1945 by Pilot Press. Photos as far as we know were taken by the Sport and General agency.